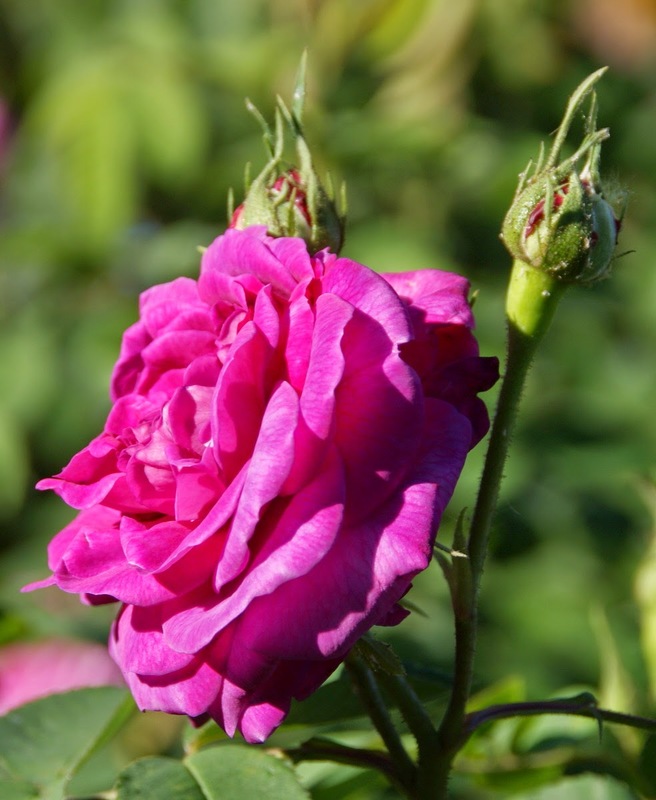 Overall March was a difficult month for the roses. We had already heatwaves that early in the year, which led to many roses not developing their gorgeous big spring flower shapes that I am used to see in previous years. 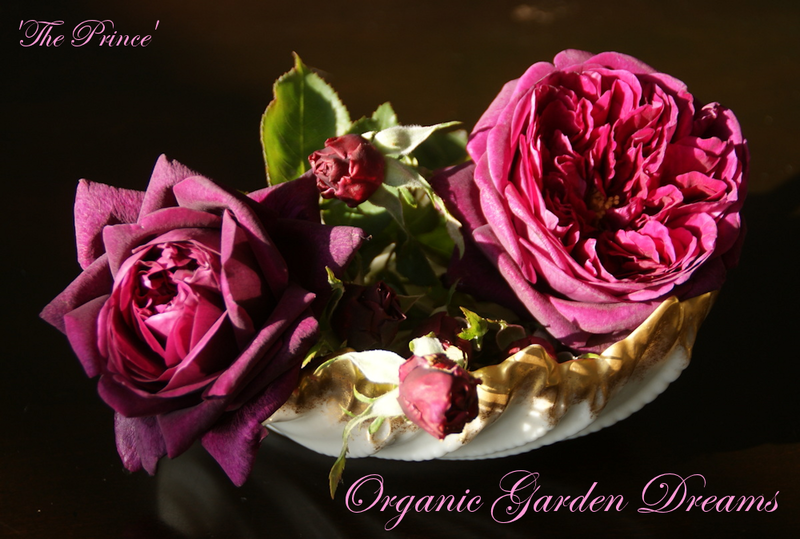 Also many rose varieties couldn't deal with these high temperatures and their petals started to crisp. Besides that, thrips have been a huge problem. I don't recall having so much thrip damage on the roses like this spring ever. These sucking insects are causing the rose petals to show ugly brown spots, especially on the edges. Since I am not only gardening organically, but also don't spray my roses to prevent insect damage, I just have to live with things like this and usually I am fine with that, but this year thrips really have been a nuisance. That being said, I still had many nice roses in March and some rose varieties weren't showing hardly any problems at all. 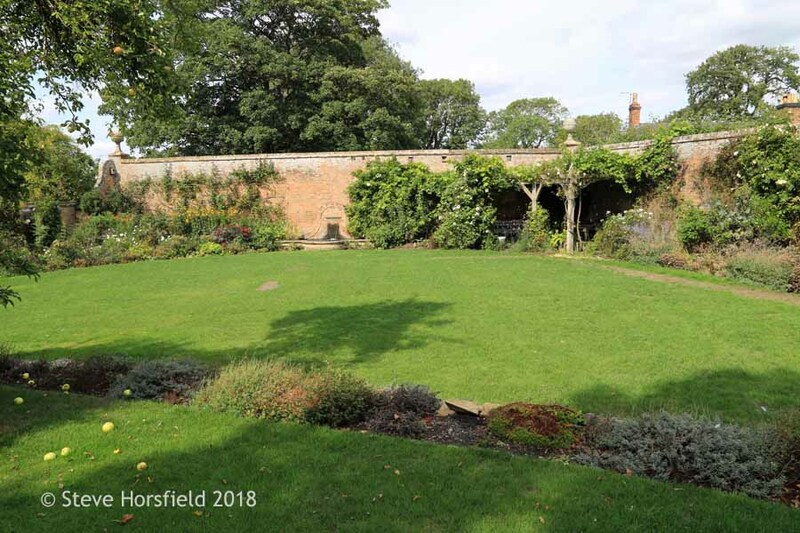 Of course, for an organic rose gardener like me it is utterly important to find the rose varieties that do well in my climate and are even able to deal with especially difficult climate situations like we had this March. 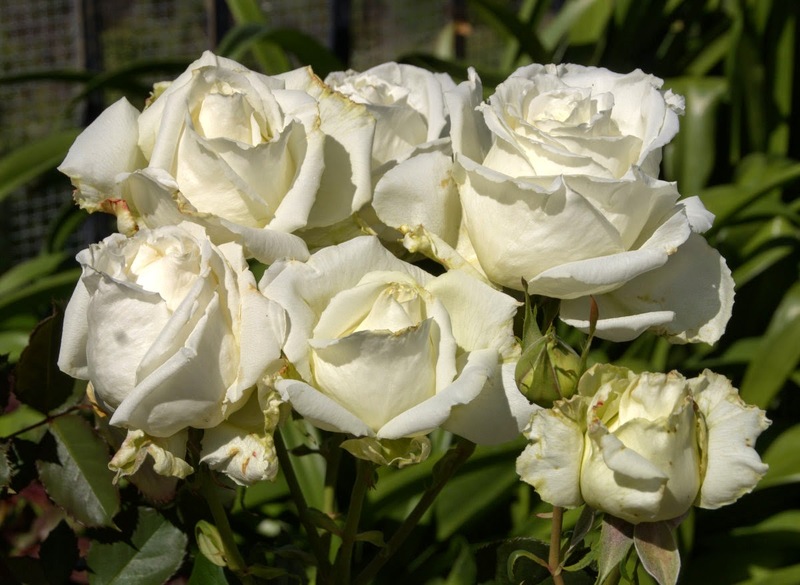 If I would have to give a price away for the best rose last month, it would go to 'Pope John Paul II'. What you see on the photo above is just one spray on a new basal cane. This rose is just gorgeous! The same spray a little bit more open. Love it! The fragrance is heavenly, too. This was the very first bloom on 'Grandmother's Hat'. A very healthy Hybrid Perpetual rose with lovely matte green foliage. You can see 'Grandmother's Hat' to the very right with her first bloom really standing out. The other two Hybrid Perpetual roses in this bed, in the middle 'Reine des Violettes' and to the left 'Yolande d'Aragon, are very much behind 'Grandmother's Hat' in terms of their flowering time. The blooms of 'Grandmother's Hat' vary greatly in color. In cool weather they are a much darker pink than in warm weather, were the color of the flower fades quickly to a much lighter and paler pink. I like this rose in all color stages, though. Here you can see that 'Grandmother's Hat' really got going and just a few days after I photographed her first bloom there were many more flowers open on the bush. Depending in what stage you catch the flowers of 'Grandmother's Hat', they may show their warm yellow stamens, which I find quite charming. 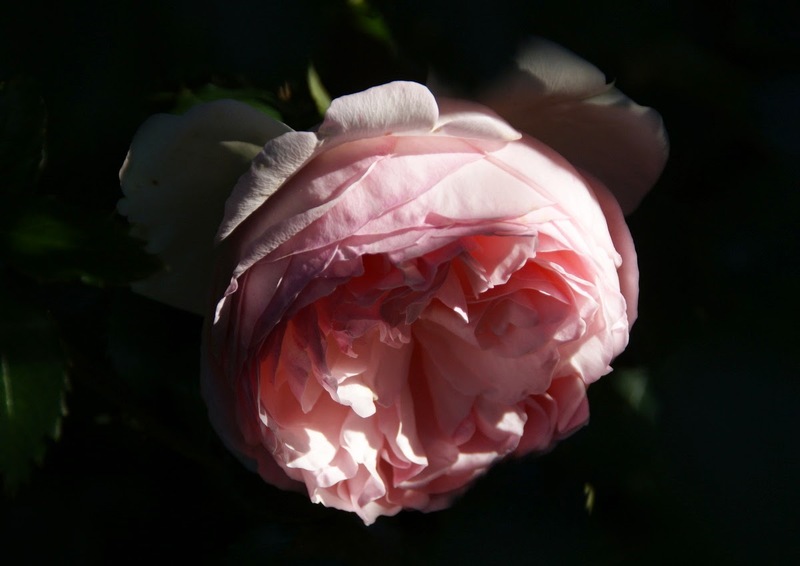 Here is a shot of one of the first blooms of 'Pierre de Ronsard' taken early in the morning. This rose has such a romantic quality. I am always fascinated by it. 'Old Fashioned Girl' is a very reliable, floriferous miniature rose in my garden. On this picture she just started to bloom. This is a relatively "new to my garden" Hybrid Tea rose that I am really excited about. I love lavender colored roses, but good ones are hard to come by. I bought 'Neptune' based on positive reviews that I read on an internet rose forum and have to say I am not disappointed. I like that the rose is lavender colored, but with a cerise blending. The reverse is cerise and the petals edging can be cerise as well. This coloration makes a very interesting looking bloom. The flowers have been big, very fragrant and of good form so far. Here is the same bloom of 'Neptune', but fully open. The flower has much faded into a more clear lavender in comparison to the previous photo. When this rose was blooming, it was very hot and if you look closely, you can see that the edges of the rose petals are slightly crisped. The rose bush is still relatively small and hasn't taken the transplant from a two gallon pot to a big terracotta container very well. 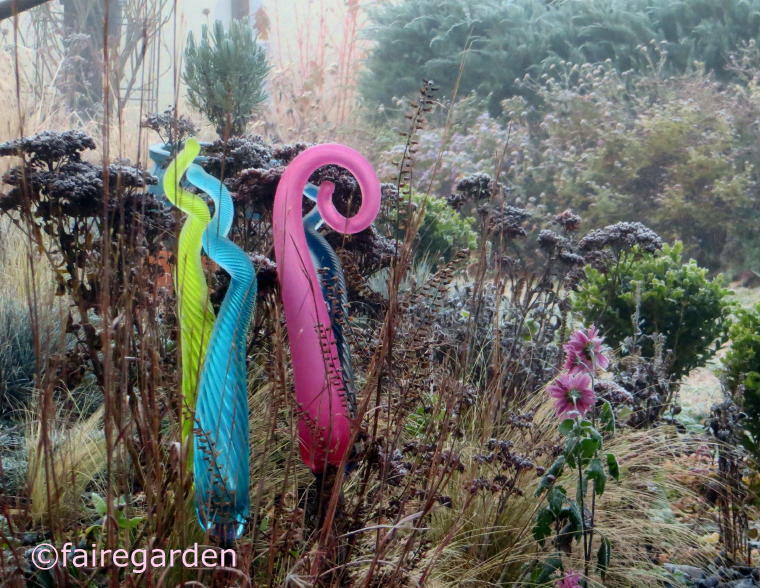 I am really curious what it will be doing in the future and can't wait for the next flush of blooms. For a comparison: This is 'Sweetness', my other lavender Hybrid Tea rose. It is always a clear lavender color and is also very pretty in my opinion. 'Our Lady of Guadalupe' is blooming her head of, heat or not. But this rose can have a very elegant flower form, which wasn't the case in this year's spring flush due to the heat. 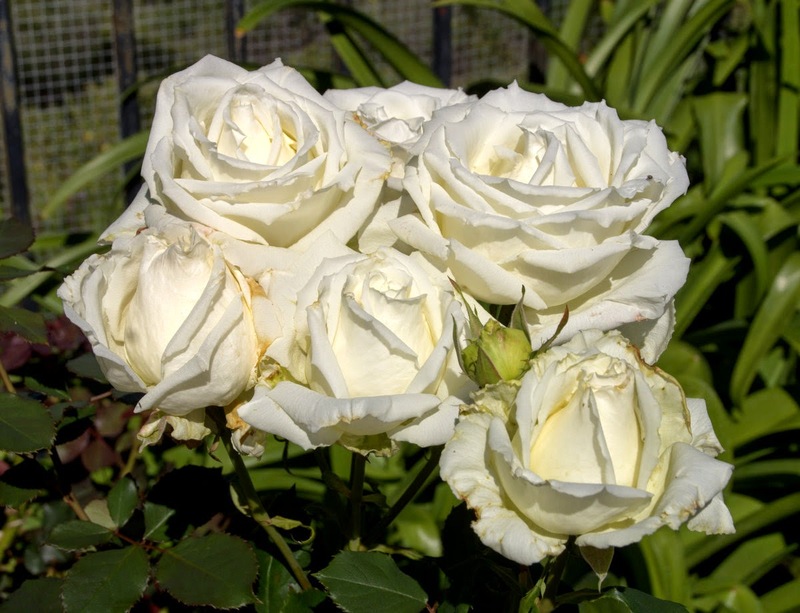 I started this post with a white rose and will end it with another (almost) white one. This is a cluster of 'Marie Pavie' hanging into my walkway to the front door. I always love her dainty blooms. Hope all of you have a good week ahead of you! The spring flush in the front yard has been wonderful so far, considering that we are since four years in a severe drought here in California, have mandatory water restrictions and had already two heat waves. I would estimate that the blooms of some rose varieties are one third smaller than usual this year and also the quantity of flowers is a little less, but it amazes me how much the roses are still able to bloom under these very difficult conditions. It is certainly one of my favorite times of the year! 'Marie Pavie' has almost reached the peak of her spring flush. 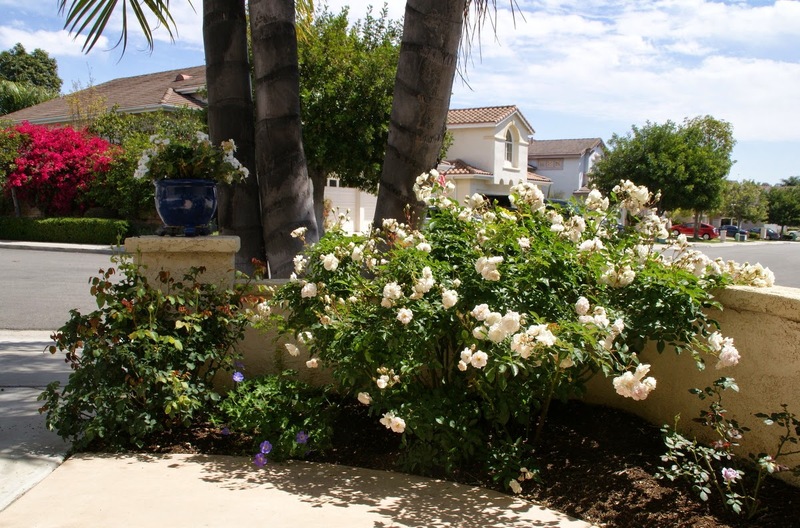 The rose in the middle of the photo is 'Our Lady of Guadalupe' of which I am growing three specimen altogether in the front yard. Like every year this rose struggles with powdery mildew, but its ability to bloom seems to be not diminished by that. In the blue container to the left of 'Our Lady of Guadalupe' I have a geranium Martha Washington 'Regal Elegance Rose Bicolor' growing, which I almost threw away last year, because it was plagued by White Flies. Now I am so glad that I didn't. I think is goes well with 'Our Lady of Guadalupe' and I am considering to plant it into the ground in this location later this year. 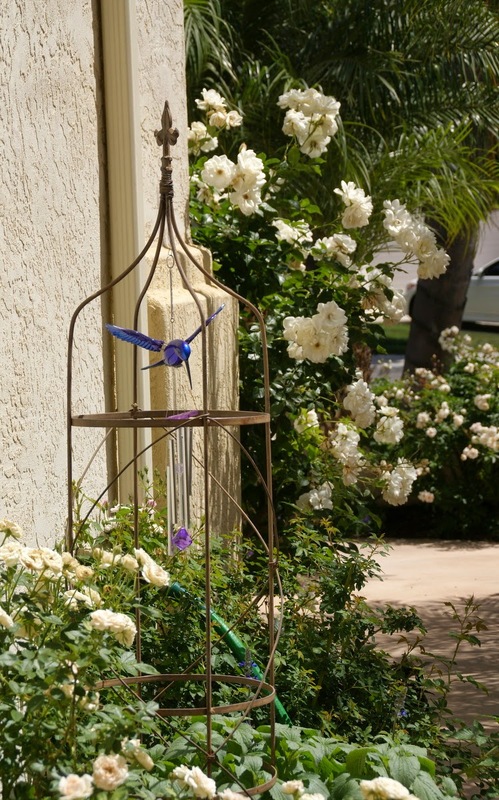 I still like my two obelisks with the hummingbird wind chimes a lot. They are set up opposite to each other at the sides of the walkway to the house. The blue of the hummingbird is a nice contrast to the white blooms of the 'Climbing Iceberg' rose peaking around the corner in the background and to the off-white flowers of the 'Old Fashioned Girl' miniature rose in the foreground. This is the view of our front door that you get, when you are standing directly in front of it on the street. But you can't walk up to the front door in a straight way, you have to enter the curvy walkway that leads up to it from the side and this is what you see when you are about to do that. The white rose in front of the garage is 'Climbing Iceberg'. 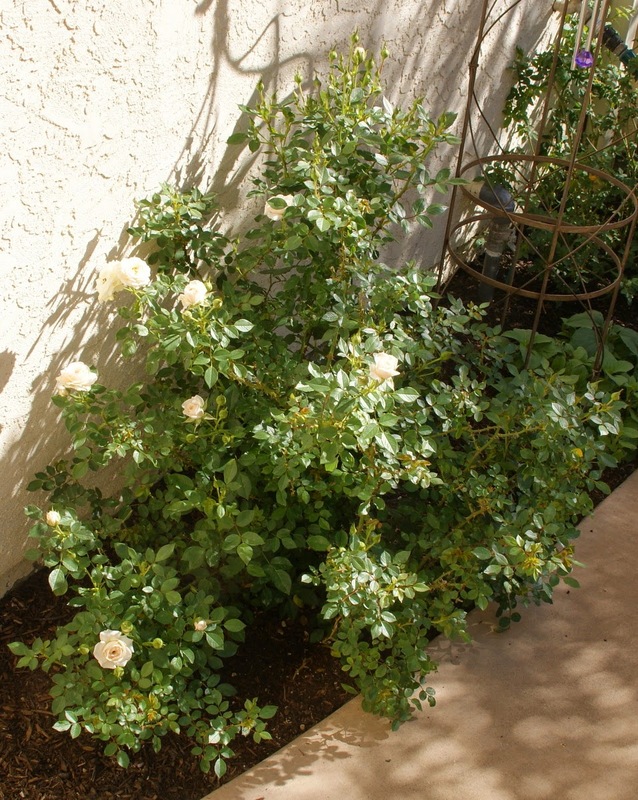 The white rose spilling over the decorative wall to the left is 'Marie Pavie' and the light pink rose in the middle of the picture is another 'Our Lady of Guadalupe'. The Pygmy Date Palm in the previous photo above is underplanted with penstemons - sorry, their name has escaped me - which have become weaker and weaker over the years. I believe that the palm roots are suffocating them. Still some were able to bloom this year, again. They have such a pretty blue color and I love the bell shaped flowers. When I open my front door looking down to the street this photo shows exactly what I see. This year I have placed four Martha Washington geraniums in the front yard either in containers or planted into the ground and I am very pleased with the color that they add in addition to the flowering roses. I think they complement them very well. 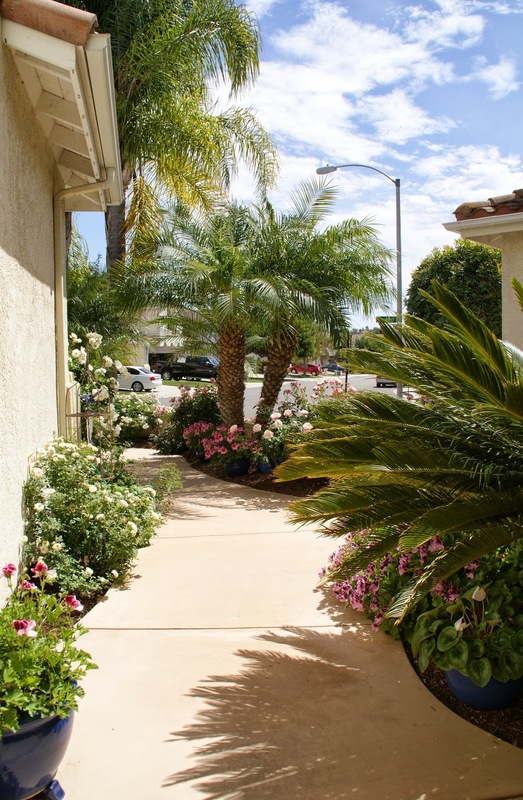 View of the flower bed to the left side directly by the front door. The rose to the very left is 'Our Lady of Guadalupe'. The rose in the center of the photo is 'The Prince', which barely had started to flower when I took the picture. To the feet of 'The Prince I planted geranium Martha Washington 'Regal Elegance Purple Majesty', which picks up the color of 'The Prince' perfectly. Before you leave our walkway to the house to enter the street, you pass by 'Marie Pavie' and get a nice whiff of her myrrh fragrance, that is wafting through the air. The rose to her left is 'Pretty Jessica', which hasn't bloomed yet. On the right side of 'Marie Pavie' I took out a very garish alstroemeria this winter and replaced it by a lavender colored miniature rose called 'Lavender Crystal'. Unfortunately, the miniature rose is struggling after the transplant from the container into the ground, but I hope it will settle in and grow into a strong, floriferous plant. 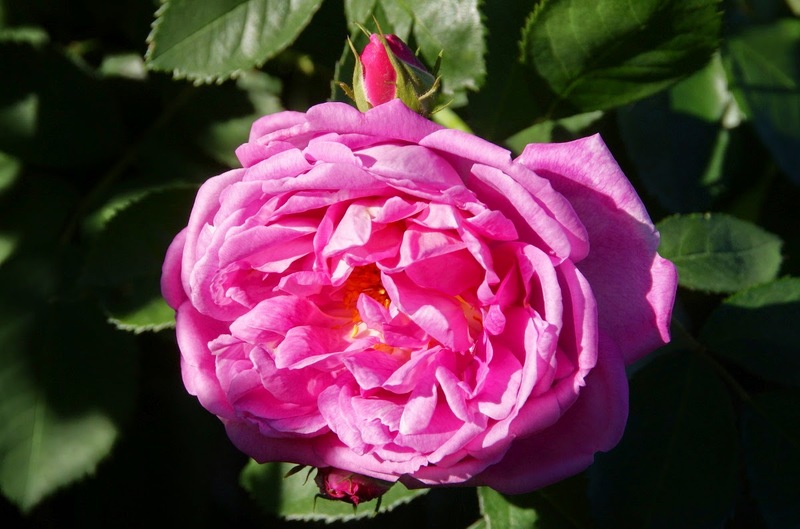 The lavender flowers of this rose are quite exquisite! 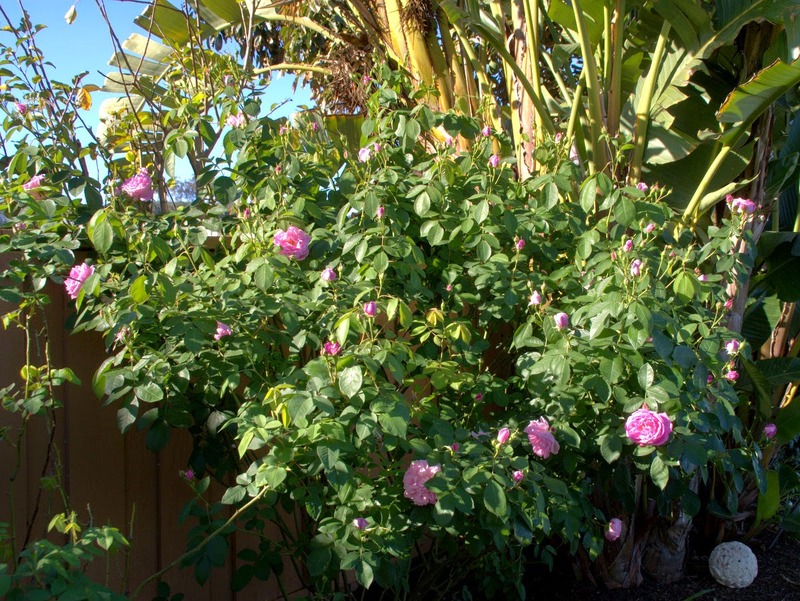 Writing up this post has made me a bit melancholic, because I wonder how long I still will be able to grow roses in my Southern California garden. The reason for this is, that as of April 1st this year California Governor Jerry Brown has imposed mandatory water restrictions for the whole state of California. He demanded a 25 percent cut in water use. As I said in the beginning of this post, we have already mandatory water restrictions here in San Diego effective since the 1st of November 2014. But I fear, that with the latest announcement of the Governor, the City of San Diego has to increase the currently existing water restrictions even more. Wishing everyone a great new week!